The affable Howard Soon burnished his reputation as one of Canada’s top winemakers during his decades of working for conglomerate Andrew Peller. In the late 1990s, his work at Sandhill included small lots from some of British Columbia’s most promising vineyards. In 2006, he added young Vanessa Vineyard in the emerging Similkameen Valley to his sources. By 2012, vineyard owners Suki Sekhon and John Welson decided to launch their own brand with Soon’s help. Last summer, Soon announced his retirement from Peller. 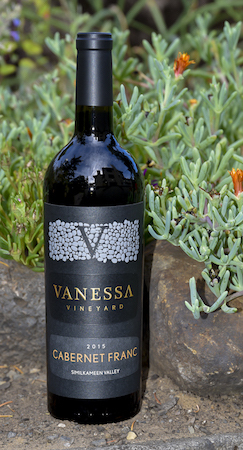 A few months later, Vanessa Vineyard named Soon as their head winemaker. They now have eight separate bottlings, six of them are red wines, including this gorgeous Cabernet Franc that’s dominated by free-run juice. Leafy, slightly smoky dusty cherry and sage aromas in this wine lead into a palate of dark cherry, fig, crisp acidity, a bit of blueberry, a hit of tobacco and substantial blueberry skin tannins. It’s worthy of pairing with a feast of roasted meat, potatoes and carrots or rosemary braised lamb. Judges awarded it a double gold medal and Best Cabernet Franc honors at the 2018 Great Northwest Invitational Wine Competition at the historic Columbia Gorge Hotel in Hood River, Ore. Prior to that, there was a double gold at the All Canadian Wine Championships.